Jake and I went on a trip last month to Washington state! 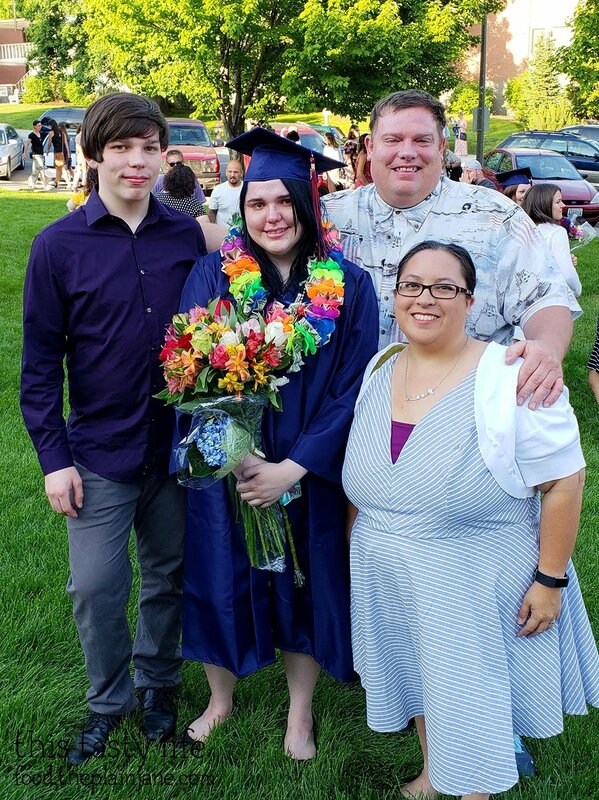 We went back up to Spokane to see Jake’s daughter graduate from high school! She’s 18 and now DONE WITH HIGH SCHOOL! Jake and I were so proud of her and her accomplishment – it only goes up from here! Can’t believe how much time has flown that she is now a graduate. And look at how tall S. is now! CAN YOU BELIEVE IT?! Ahhh, I remember when I could see over that kid’s head and now he’s almost as tall as his dad (we we on a slope so they look like they’re the same height in this photo). Since I don’t feel like doing separate posts for every place we went to, this will be one BIG post of highlights of the food we had in Spokane! Our first stop in Spokane after we landed in the airport was to head into Downtown Spokane for lunch at the Satellite Diner. 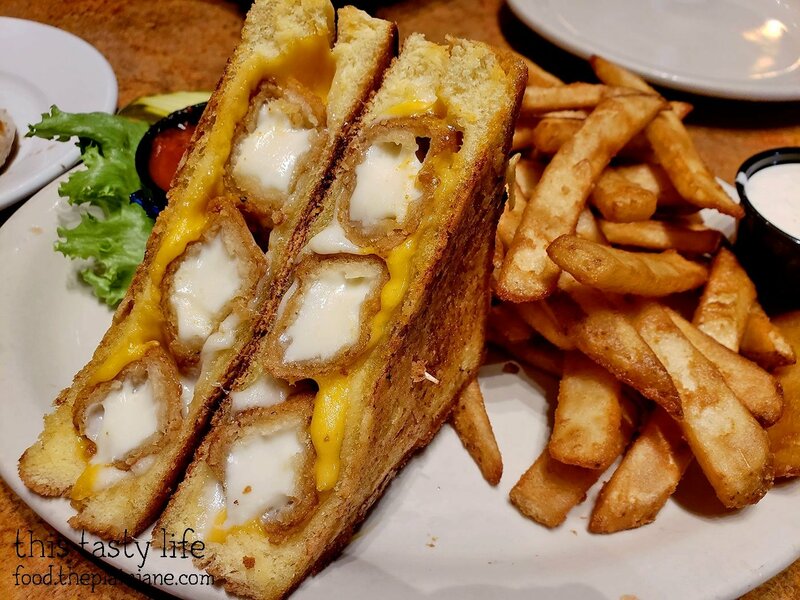 Jake and I shared the Cheese Bomb [$13.95] which is a Parmesan crusted grilled cheese sandwich with provolone and cheddar cheeses with mozzarella sticks in the middle! It was cheese on cheese with some cheese on the outside! It came with a side of marinara sauce which was totally brilliant – made sense with the mozzarella sticks inside the sandwich. I’m glad Jake and I shared this because it got to be rich after awhile, but I loved it! There was a nice crunch from the crusty bread and from the mozzarella sticks. It was so gooey and lovely! 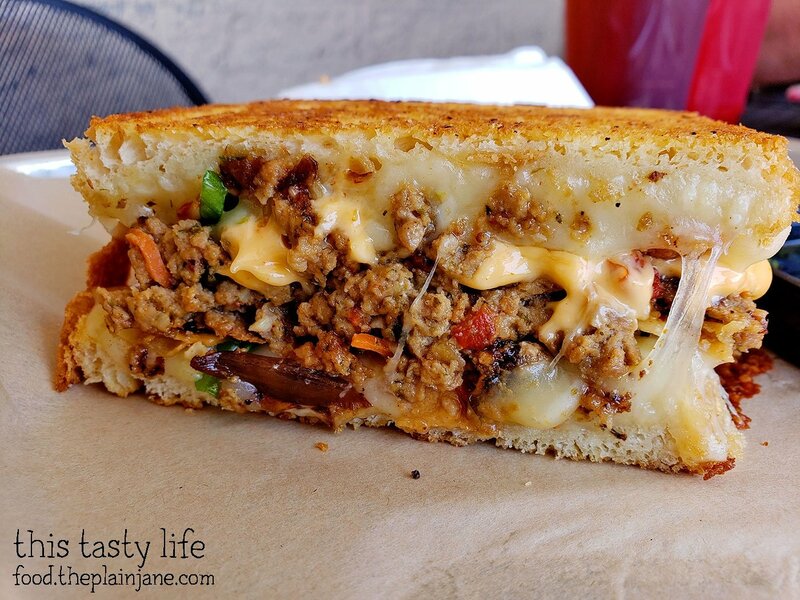 We shared the sandwich with a side of grilled chicken breast [$5.00] for a little protein. 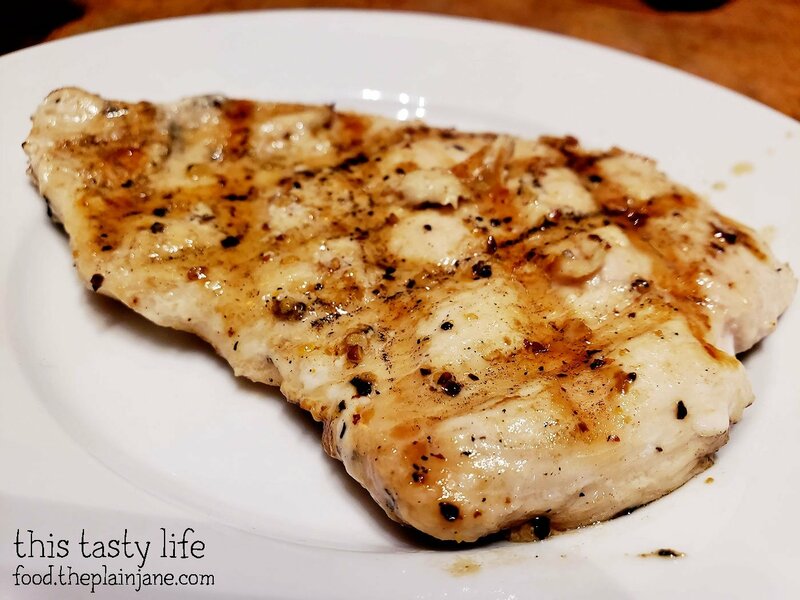 It was nicely grilled and managed to stay juicy! After lunch… it was time for a little bit of sweetness! Hello Sugar is a new mini donuttery (is that a word?) that had been open for about a week when we visited. I was excited to get some mini donuts! Hello Sugar shares the space with a place that serves from “not coffee” drinks (plus coffee drinks!). Heh. 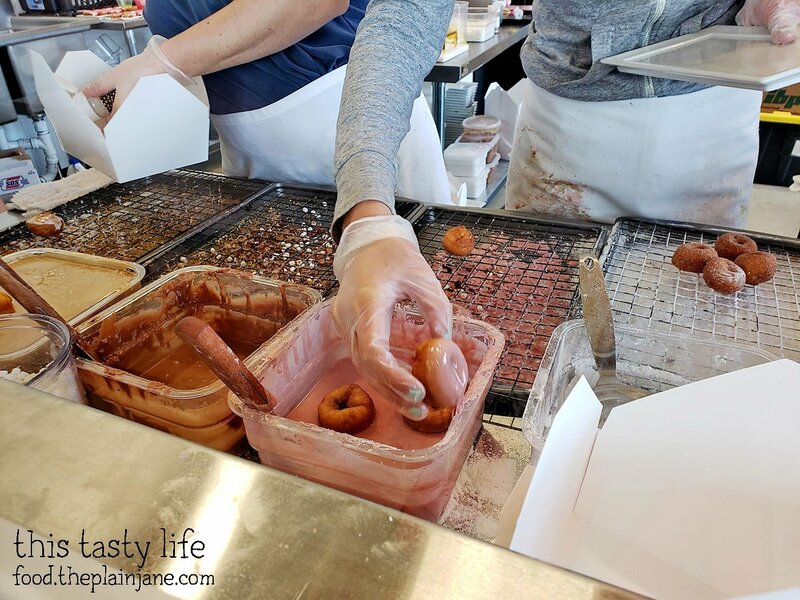 The mini donuts are being cranked out all the time and you can sit and watch them make the tiny donuts. 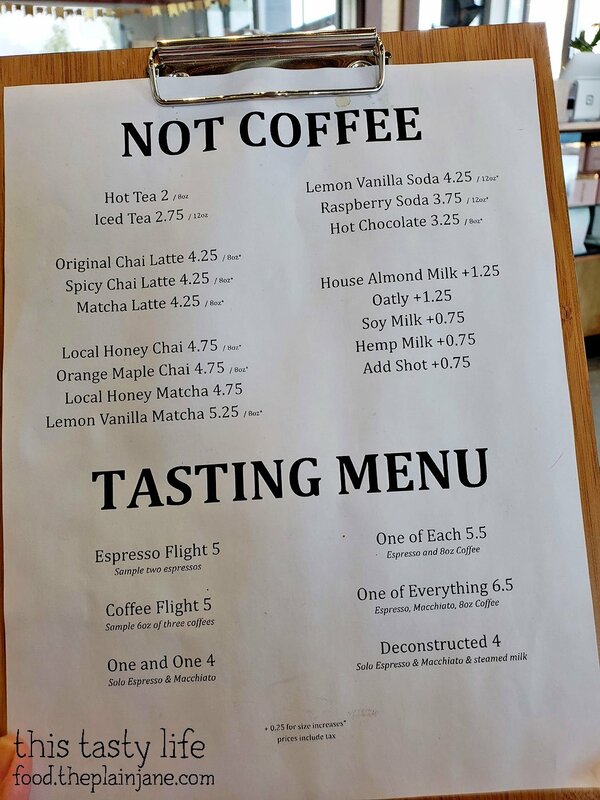 Jake and I shared a dozen plus some of the best tasting chai lattes I’ve ever had. 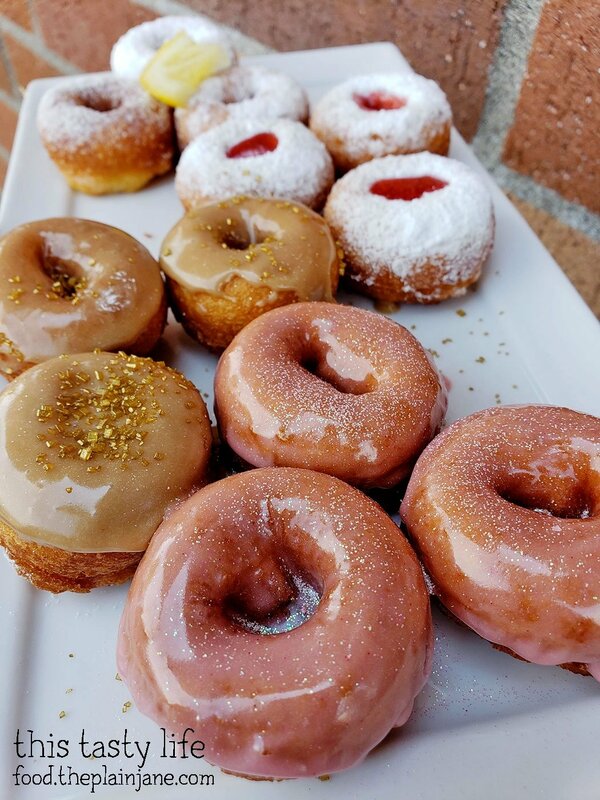 Donut flavors (from left to right): Dutch Baby (lemon), Strawberry Shortcake, Sugar Maple, and the original Hello Sugar. I can’t tell you how much I LOVE the sparkle in these tiny donuts. The maple was my favorite of the bunch! The Dutch Baby needed more lemon flavor. All of them were great though since they were so fresh. 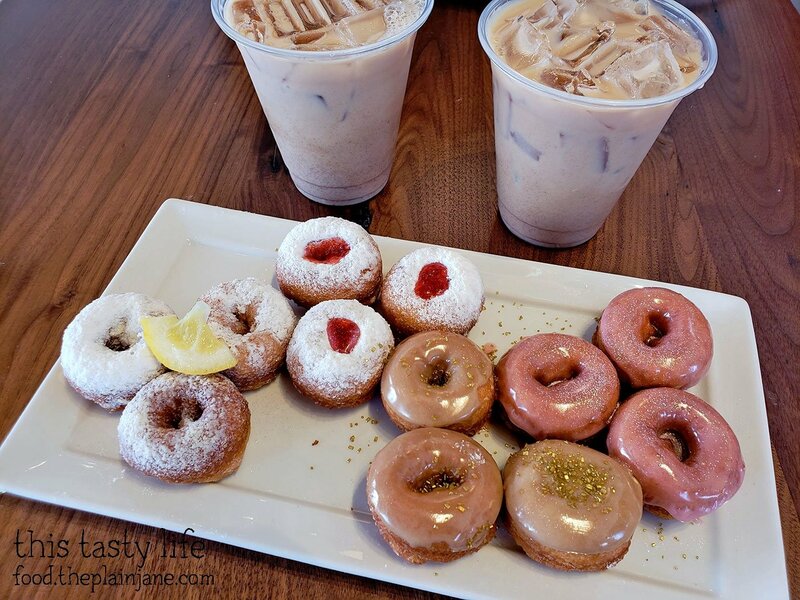 You could taste the crispness of the freshly cooked donuts and they were super fluffy on the inside. I also liked that none of the glazes were uber sweet. A winner for sure! The next day after our arrival, Jake and I had breakfast at a cute little spot called the Maple Street Bistro. We shared a Breakfast Club sandwich on a fresh bagel that went into a panini press. 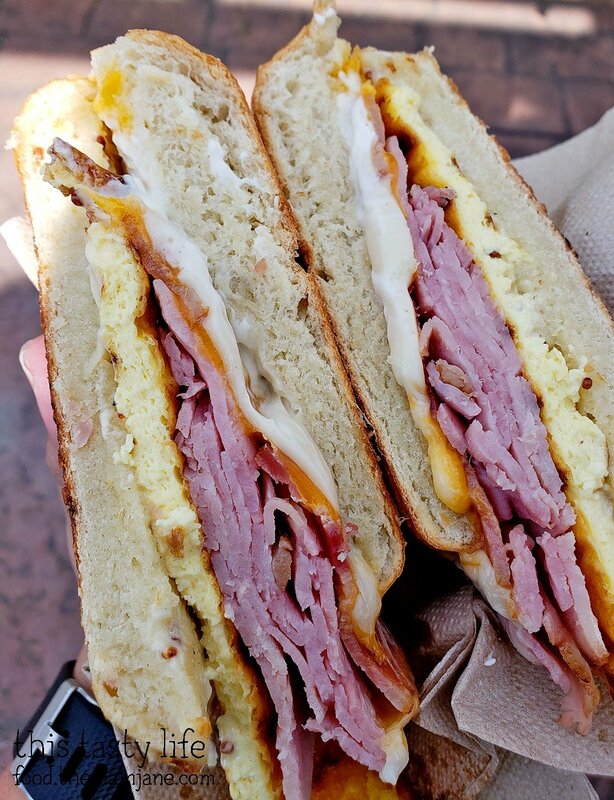 The sandwich was stuffed with ham, bacon, egg, swiss and cheddar cheeses, cream cheese, and a touch of honey mustard dressing. Quite a filling sandwich! 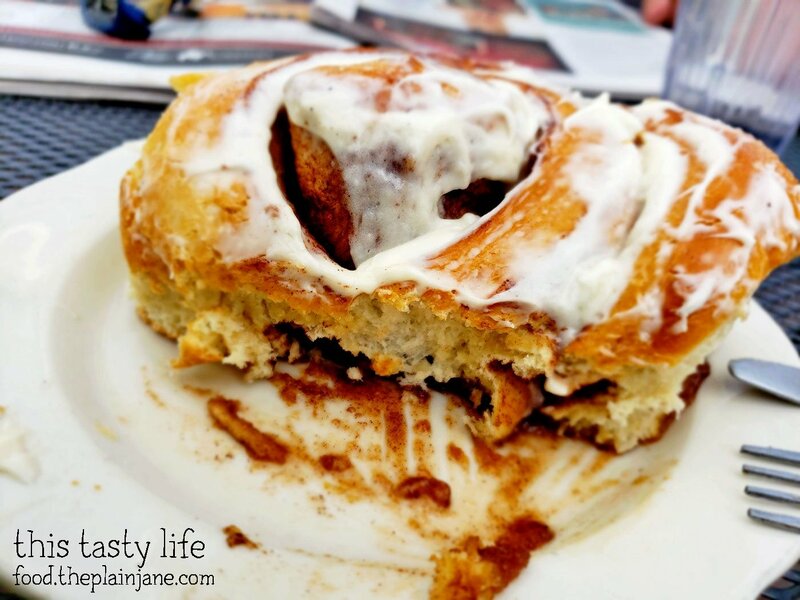 We also got a freshly made cinnamon roll. Not overly sweet, but I think it could have used another dollop of cream cheese frosting on top. I also snagged this yummy chocolate chip filled scone. I ate this over a couple of days actually because I got full. 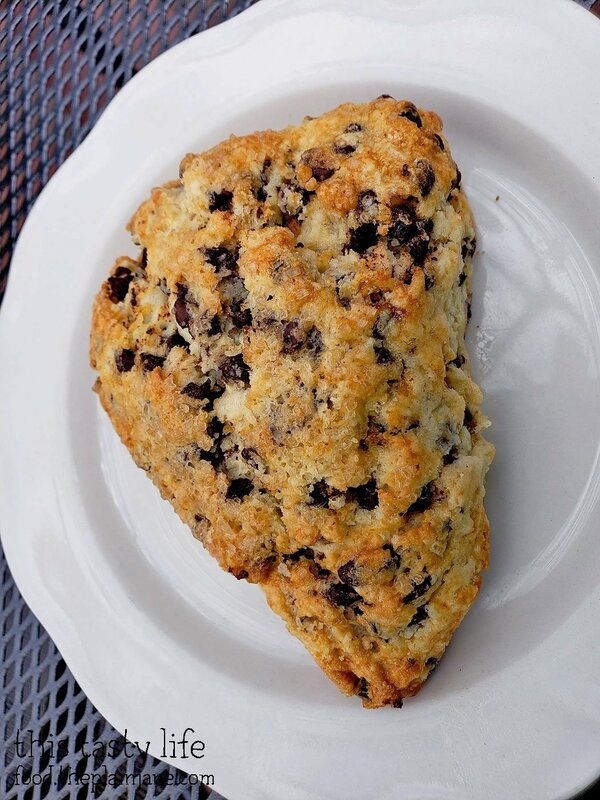 I loved the crispy buttery texture on this scone and it has PLENTY of chocolate chips filled in every nook and cranny. For lunch, we headed over to Idaho for our one revisit on this trip. Back to Meltz Extreme Grilled Cheese! We got the Potsticker Meltz [$7.25 for a half] again. It was just as amazing as the first time we had it. 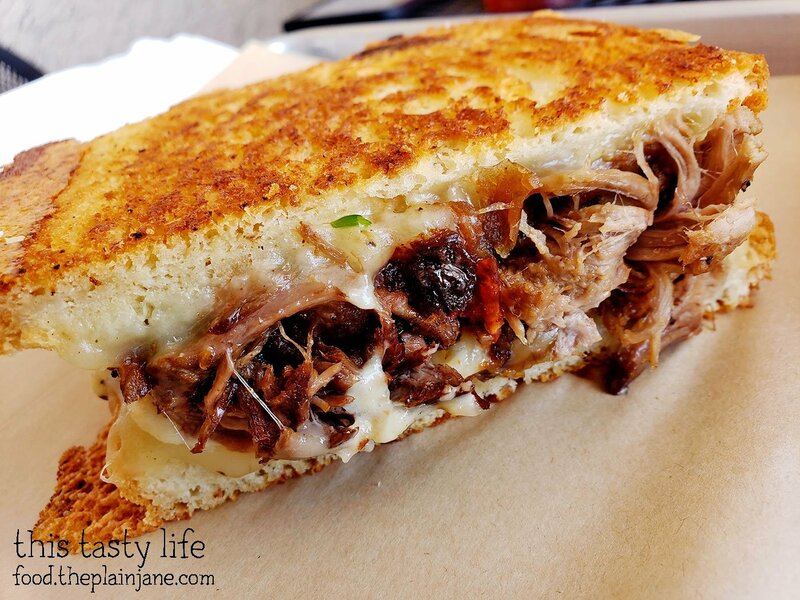 We also tried a half sandwich of the Huckleberry Heaven [$7.50] which is a grilled cheese stuffed with white cheddar, braised short ribs, caramelized onions, and huckleberry bbq sauce. It had a great flavor but holy hell was it RICH. 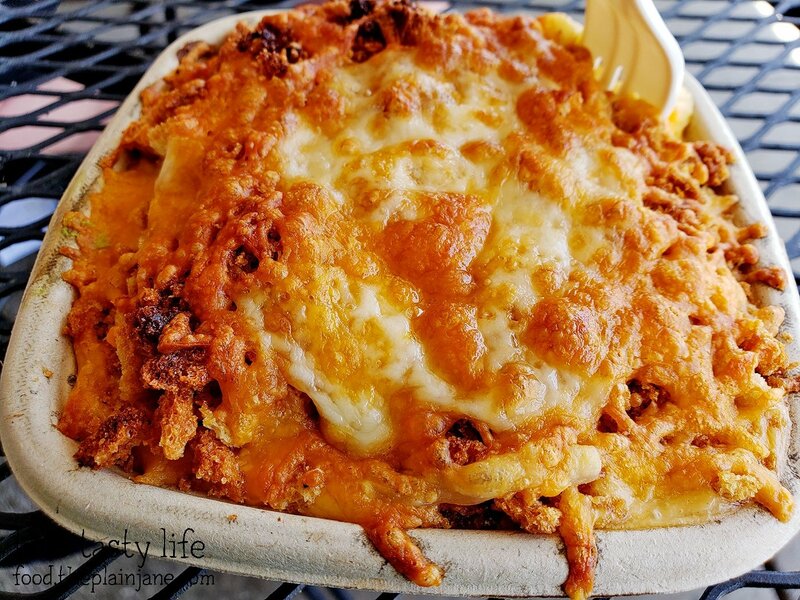 We also tried their super creamy macaroni and cheese that has a crouton crust on the top. SO CREAMY! 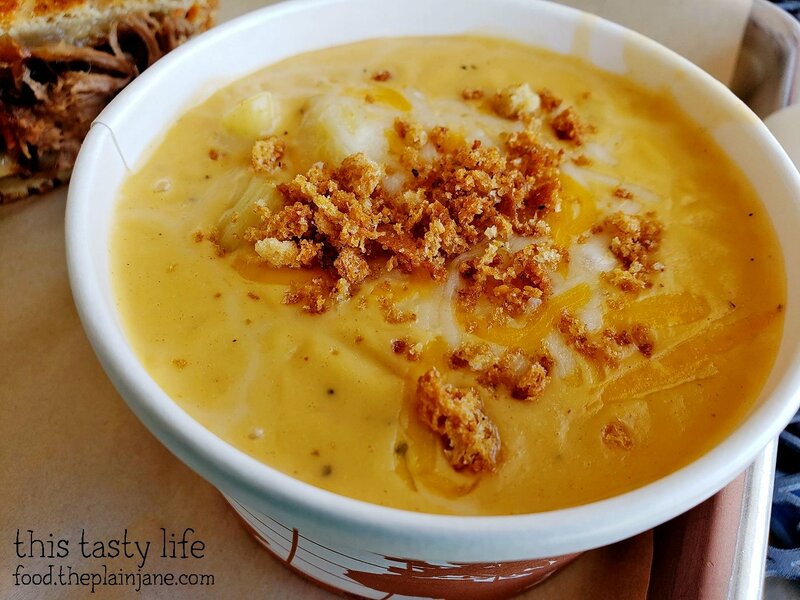 And my absolute favorite… the mac n cheese soup. YES, a SOUP! It’s like eating a soupy melted cheese with bits of macaroni pasta in it. I LOVE IT. Totally worth a trip to another state (don’t mind that it’s like less than 30 minutes to Idaho from Spokane, ha). After lunch, I wanted to get a little sweet treat! We found this little food pod lot in Coeur d’Alene that housed a few food trucks and trailers. 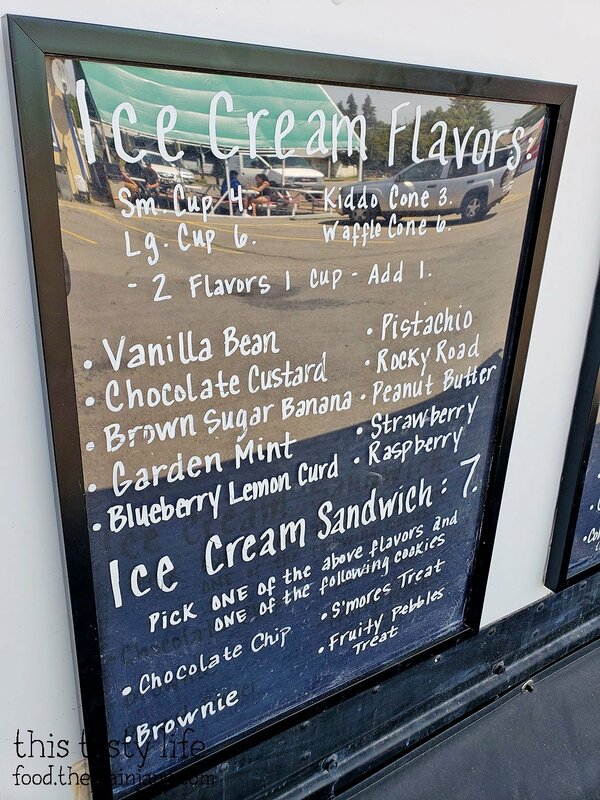 Among them was a spot called Street Treat that makes nitrogen ice cream. 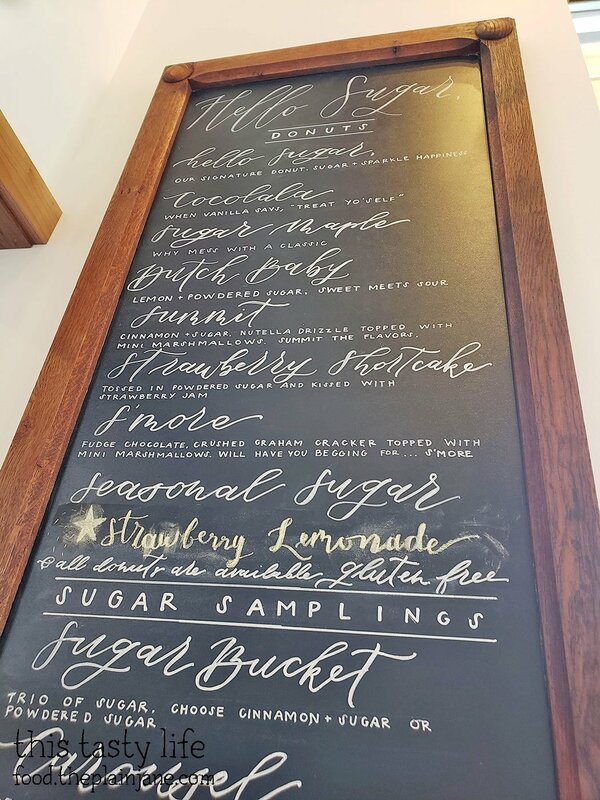 I went for a scoop of the Blueberry Lemon Curd. 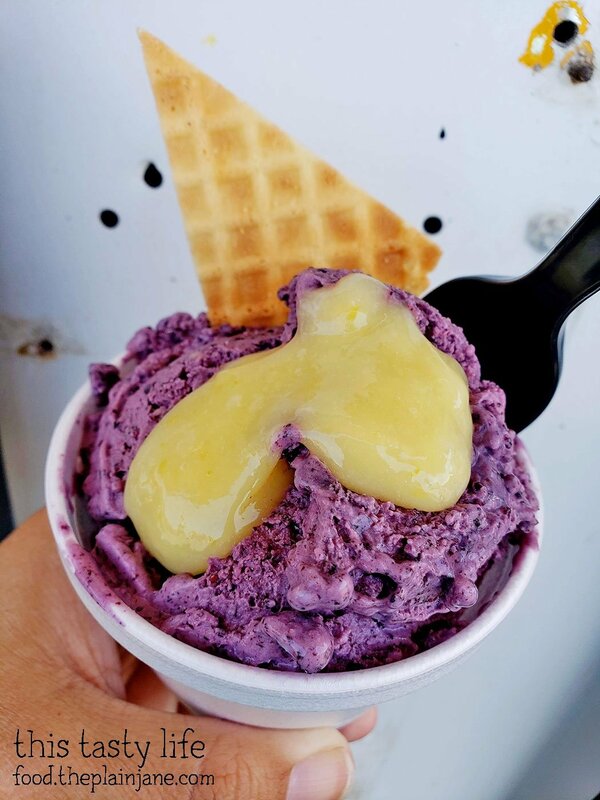 The blueberry is bursting with blueberry flavor and it was incredibly creamy and smooth. The tart lemon curd on top gives it a nice contrast in flavor to balance out the sweetness of the ice cream. After A’s graduation ceremony, we took the kids out to dinner at a place in Spokane called The Flying Goat. 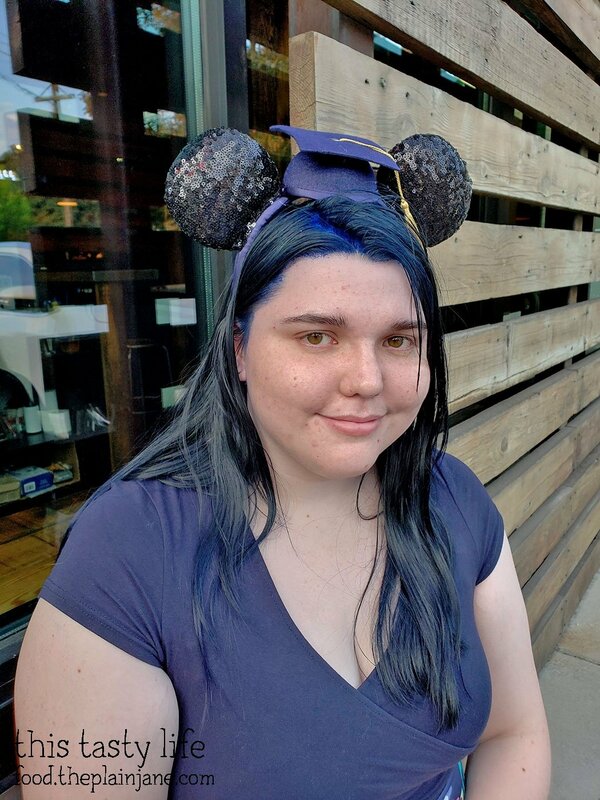 Here’s the new graduate with some Mickey Mouse ears that we picked up for her in Disneyland! I got a soft pretzel. It came with a side of very very runny honey mustard dressing. I wish the dressing was a little thicker. 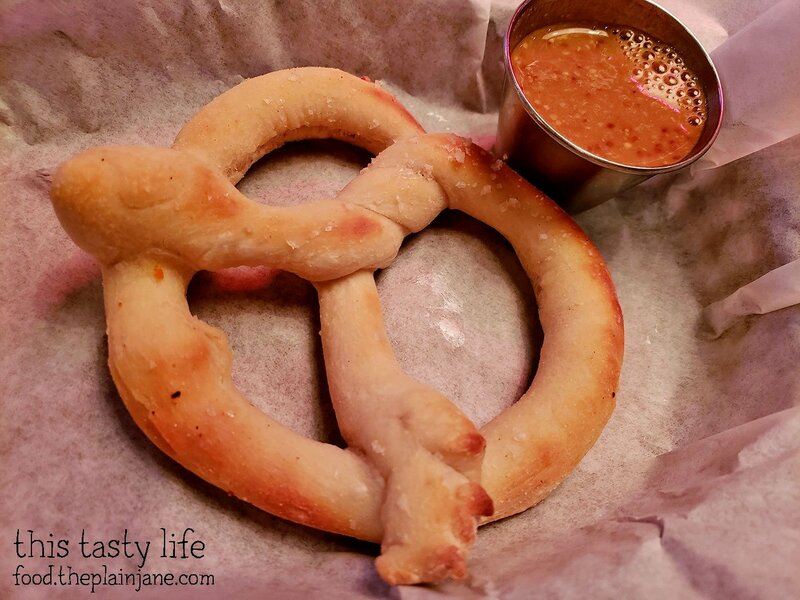 The pretzel wasn’t terrible. Wasn’t amazeballs either. We shared two pizzas. 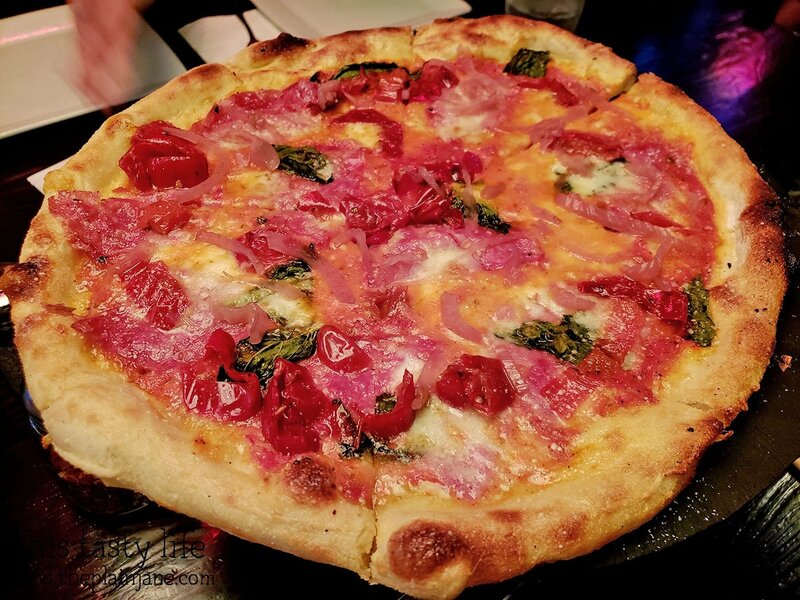 This one is the Liberty [$16], topped with red sauce, mozzarella, sopressata, peppers, pickled fennel, and fresh basil. 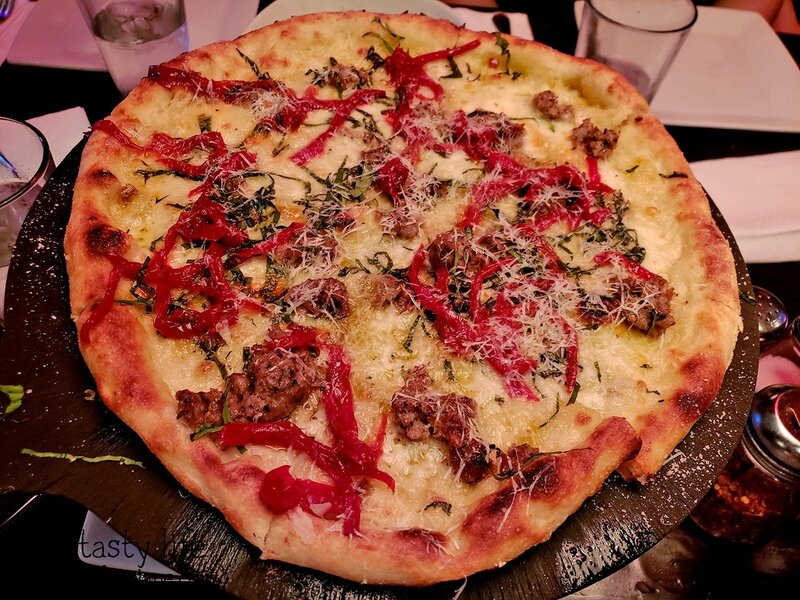 This pizza is the Lacrosse [$16] which had olive oil instead of sauce, mozzarella, Italian sausage, red pepper preserves, fresh basil, and shaved pecorino cheese. The outer edges of the crust were good but the pizza suffered from being pretty soggy in the middle. 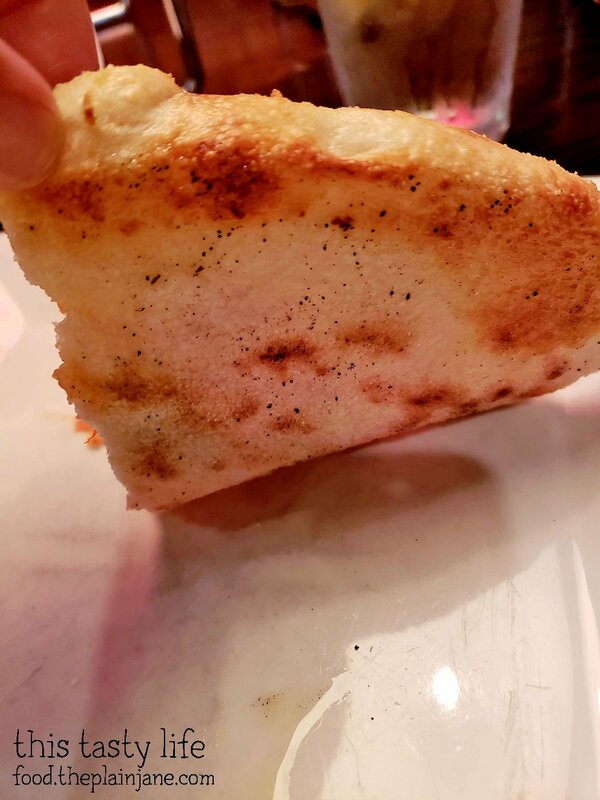 Overall though the crust was light and chewy and had a nice flavor. Both pizzas were good, but I didn’t feel that either of them were mind blowing. But still they were some solid pizzas. It was great being able to spend some time with the kids (though not nearly enough since S. was still in school and A. had work) and to revisit Spokane! I’ll have a few more posts to share soon about our road trip across the state of Washington along with some posts about Seattle! Stay tuned! Cool! Looking forward to your Seattle posts! That cheese sandwich looled amazing as well as those made to order mini donuts. Everything is more fun to eat when it’s tiny, haha. I love tiny food. It does seem to taste better, I swear! Seattle posts coming soon!